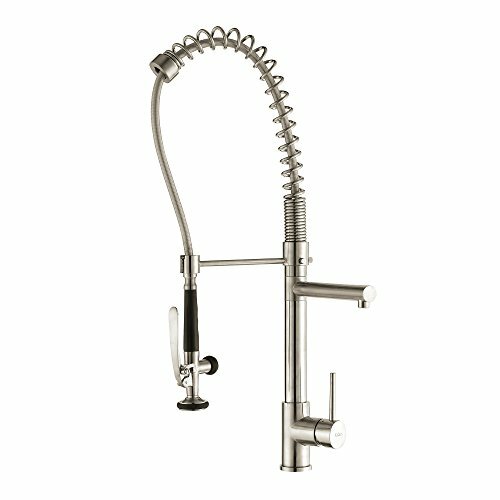 Commercial fusion style faucets are ideal if you want a true centerpiece to your kitchen that is not only visually distinct from other faucets; they often come with some of the best performance available, with excellent volume flow and water consumption. 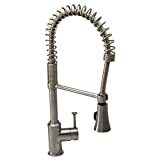 Listed below are the best commercial fusion style faucets available currently on the market. 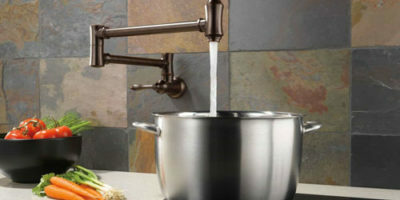 This industrial kitchen faucet offered by Danze does not do things by half. If you can get your head around the somewhat heavy looking spray head, what you get is an excellent performance commercial fusion faucet with great reliability to boot. The build is solid brass throughout which allows for this reliability to occur. There is a single handle that is bound in rubber that you can utilize to maneuver the spray head around your sink area with ease, especially when the reach of the head itself is some 22 inches in length. 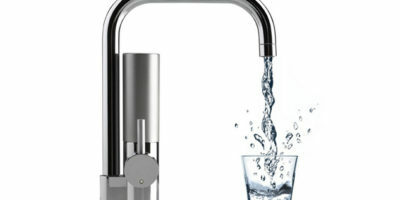 This particular faucet is also incredibly economical, with users reporting excellent results at just 1.5 GPM at 40psi. There are two modes as per standard, the single stream, and pre-rinse spray and both are excellent at fulfilling their roles. Currently, it is only one hole installation and the spring in the faucet is rather heavy, which can limit its reach somewhat but the finish is excellent and pricing is towards the lesser end of the spectrum. If you can get over the chunky look and feel, this is a faucet worthy of your attention. Made of brass and noted as having some of the best performance figures in the commercial fusion market, this Kraus is one of the very best faucets available. For one, the construction is solid brass and this means that it has excellent reliability. Secondly, the looks are fantastic, with good consideration given to overall weighting and practicality. This allows for a 28-inch extendable hose to be incorporated into the unit and with 360° rotation and this provides excellent all-around usability. The water pressures generated also mean you can blast dirt and grime away as well as fill containers in double time. The water flow is 1.8 GPM considerably less than other units but thanks to the pre-rinse spray and effective dual diverter of the water, the flow rate is never an issue nor is water pressure. This is currently only available for one hole installation thanks to the need for only one tap, but try to get your hands on this faucet if you can. Its somewhat inexpensive and thus comes highly recommended. Sometimes, you just have to incorporate a pinch of style into the faucet market and this is definitely something considered by American Standard with this particular unit. 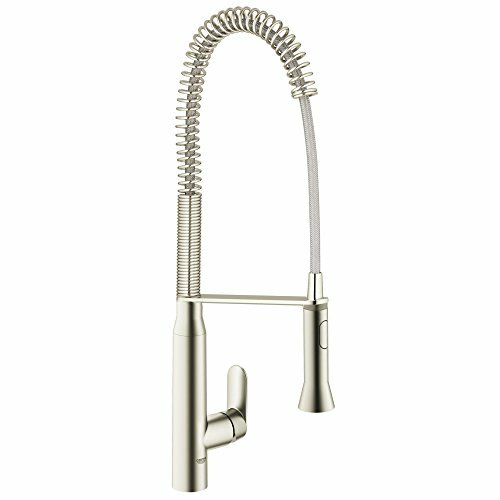 The overall look, with its bell-bottom spray head and slimline hose, makes it fit fantastically well into modern kitchens and the construction itself is also full metal, with a brass base providing excellent support for the rest of the faucet to construct itself off. It is a single handle unit, the handle facing forward for good fine tuning of both water temperature and water flow. The arch of the unit is also excellent, which makes the filling and washing larger containers much easier than with some other faucets in this style. The flow rate is a little higher than other products, at 2.2gpm but this is still well within industry guidelines and the whole faucet comes guarantee drip free thanks to the ceramic disk valves installed in the faucet head. There is also a limited lifetime warranty providing that you installed with a certified plumber. There are some issues with the reliability of this faucet stemming from the spray head itself however, that means whilst it is great in its own right, it is not the most recommended unit here. 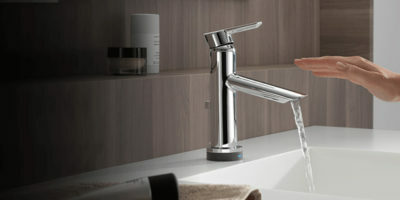 This Grohe faucet is one of the most physically imposing on the market. Coming some 4 inches higher than competing lines, at 26.5 inches tall this means that you have ample room below it and an elevated reach over some of the trickier parts of your counter-top which is always a plus. 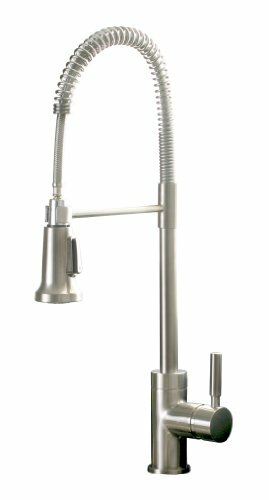 With a solid brass construction and a stain resistant stainless steel or chrome finish, this also makes the whole faucet look and feel reliable right from the word go. Installation is a breeze, as long as you have a one plug system and the flow rate of 1.75 GPM also ensures that you get good performance in regards to cleaning and filling of your numerous kitchen items. One of the best features is the SilkMove ceramic cartridge that ensures you get an excellent fine tuning of water flow and temperature each and every time you turn the faucet on. It even comes with an easy clean head to ensure that you do not waste excess time doing the chores anybody enjoys. One issue is that the spray head itself is made of hard-wearing plastic, but the performance means it is seen as a viable option by many. Once again, this unit is also relatively inexpensive. This particular faucet offered by Ultra is one of the cheapest faucets in this category, yet thankfully it also manages to be one of the very best. One of the factors as to why is the spray head performance, which consumes water at 2.2gpm and thus fills your pots and pans and cleans them incredibly well, in a powerful and consistent fashion. The single handle design is also fantastically smooth and accurate to the touch, ensuring that you get a consistent flow and adjustment of temperature time after time. One of the very best aspects, however, is the very look of the faucet. 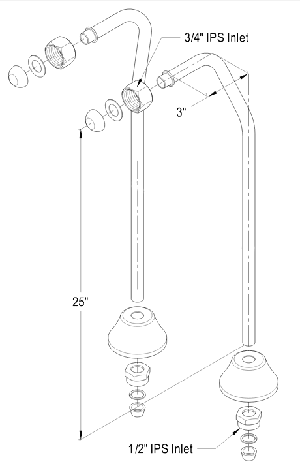 With a pull-down hose of some 20 inches in length and a well-sprung spring to hold the unit in place, this is offset by the spray head itself and the overall experience is fantastically weighted and solid to the touch. Currently, installation is just for the one hole and no covering baseplate is provided by Ultra, which is a shame and the cold and hot tap are reversed from the standard configurations. But for the looks and performance, this is a faucet worth the punt. 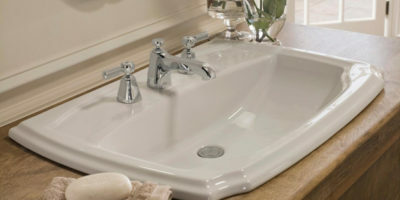 Durability is the aim of the game with this particular faucet from Premier. 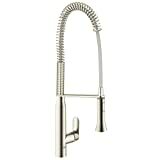 With the industry standard full brass construction throughout the body of the faucet and a heavily sprung spray head that feels durable and solid to the touch, the finish upon the faucet is also scratch, stain and watermark resistant which ensures the sleek body and high arch spout look are maintained. 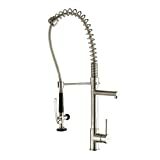 This also gives you excellent room to maneuver below the faucet for when you need practicality the most in your kitchen. Water flow is towards the upper end of the spectrum, although this does give this particular faucet excellent performance for spray cleaning as well as the filling of containers. The spray head is made of plastic but is durable with few issues raised. 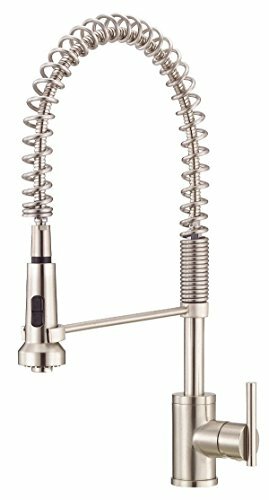 The single tap allows for an excellent fine-tuning of both heat and water flow and the installation is also excellent, as is the competitive price with other faucets reviewed here. It is important to bear in mind however that the spray head does not properly extend giving you limited reach when utilizing the faucet. Thus, it is not the most recommended here but the looks and pure performance may win you over. Originally developed for an industry/commercial environment where performance is key, each and every faucet presented here has an excellent water delivery and will thus make your life a lot easier in the heat and bustle of the kitchen. Commercial faucets are big, bold and beautiful, especially on a central island in your kitchen where people will naturally notice it a lot more. With their reliable look and chunky, shiny aesthetic, many people will approve of them greatly! One of the very best things about a commercial fusion faucet is the sheer practicality of it. You can fill huge containers, clean oven trays etcetera with ease and the overarching reach of them means you will never ever get in a tangle. The heads are also easy to grasp and aim. One factor that should not be underestimated is the installation ease when you choose a commercial fusion faucet. Many configurations come with the one tap for added convenience as that is all you need to control water flow and this helps keep the faucet looking sleek and practical. Often with commercial faucets comes an excellent guarantee, as there are additional parts installed that you would not typically find on other faucets of this kind. One of these is the spring installed in the hose of the unit itself, and this allows for not only a good range of movement but also control over how you wish to conduct your kitchen business. 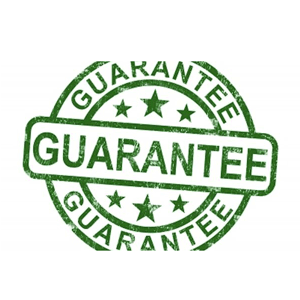 With most guarantees, ensuring the product was installed correctly these type of guarantees do not fall through. Reliability is also by and large excellent for these faucets. Thanks to the substantial design, it is incredibly important that you check the dimensions to ensure that it will have the required reach that you desire, as well as ensuring that it will not over-dominate your kitchen and surrounding workspace. What is meant by this is to ensure that the spray that emerges from the faucet is both powerful enough and will not become clogged easily if you live in an area of hard water? This is where consulting others on their faucet performance in your local area can come in handy! As good as it may appear initially, getting everything wrapped in shiny chrome may not suit your kitchen style and this has been reflected somewhat by the reviews above. Ensure that the look you go for will suit the rest of your kitchen and ensure that it is stain free. Whilst most of the faucets detailed above come with incredibly similar guarantees, it is never a bad thing to fully appreciate the full extent of the ins and outs of the faucet you are buying. Ensure you follow the instructions on the faucet fully to ensure your guarantee will remain valid. 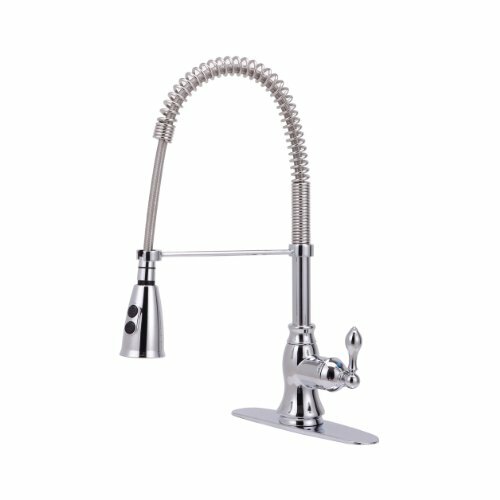 Hopefully, this guide to the commercial fusion style kitchen faucets has been of great use to you throughout your quest to find a suitable faucet for your cooking center station. 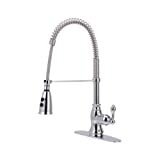 We covered every stage of the buying process, and remember that these are the best commercial fusion kitchen faucet reviews currently available. Faucet Mag!